An image of the sculpture the Towers Art Project, more commonly known as the Three Mushrooms, on the campus of the University of Northern Iowa in Cedar Falls, Iowa. 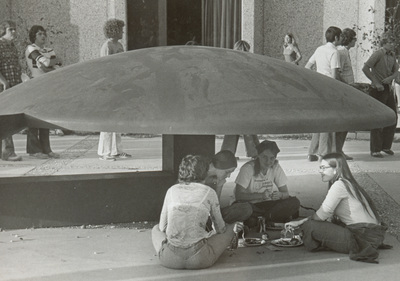 The sculpture by Anthony Padavano was installed south of the Towers Center in 1973. The medium is painted steel. "Mushroom as shelter" (2019). Art on Campus Photographs. 12.